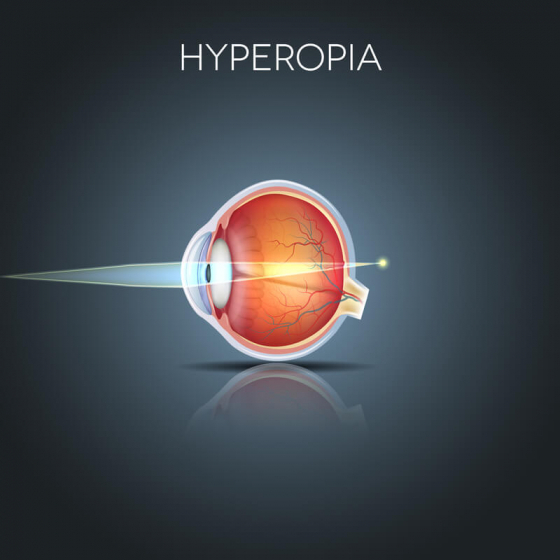 More commonly known as long-sightedness or hyperopia, Hypermetropia comes under a group of conditions defined as ‘refractive errors’ which results in objects nearby being blurred and out of focus, while objects in the distance are sharp and in focus. Understand about the causes of these errors and how you can go about correcting your vision. These ‘errors’ cause problems with the eye’s ability to focus light onto the correct part of the retina, affecting the sharpness of your sight. Long-sightedness usually results in objects nearby being blurred and out of focus, while objects in the distance are sharp and in focus. Corrective lenses or laser eye surgery can be used to treat the problem. Adults can often develop long-sightedness as they age, more noticeably after 40, however, age-related long-sightedness is defined under a different condition – Presbyopia. 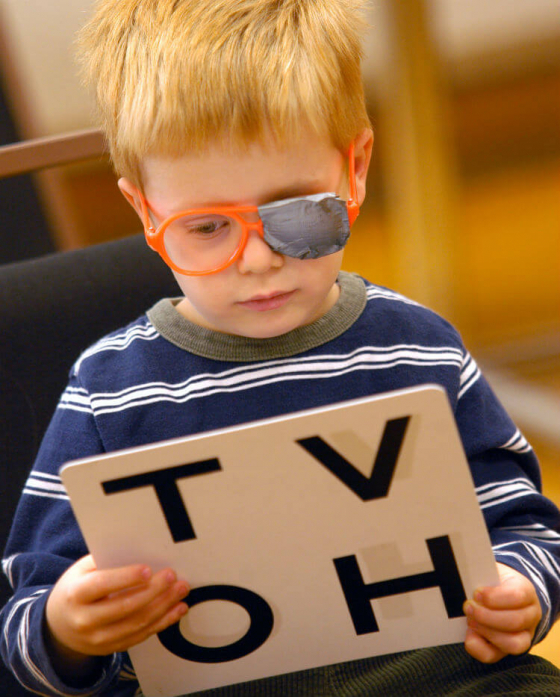 Children can be born long-sighted but it often corrects itself when the eyes develop. However, their eyes are generally more flexible and sometimes compensate for long-sightedness. This means that they don’t usually experience problems with their vision. However, if hyperopia is left untreated, it can have complications (see below) - it is important children have regular eye tests to monitor the condition. Squint – also known as strabismus, the eyes do not align correctly with each other and focus on different things. This can cause problems with depth perception (judging the distance of objects) and the brain may begin to ignore one eye’s output. This potentially weakens the eye and can result in lazy eye. Lazy Eye – also known as amblyopia, this is where one eye dominates the other. This can happen because of a squint or another eye problem. If this remains untreated, the weaker eye could lose vision altogether. These complications can be treated with an eye patch (worn over the stronger eye). The brain is forced to use the weaker eye, strengthening it again. Glasses may be prescribed to help balance the vision, or in severe cases, surgery may be required to expedite the strengthening. 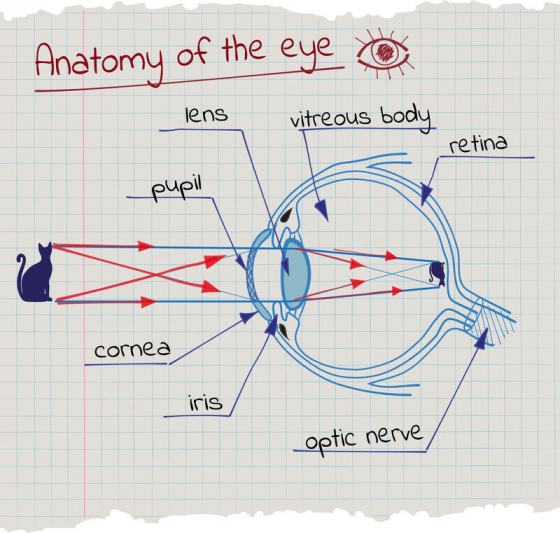 Cornea and Lens are positioned at the front of the eye to help focus light coming into the eye - similar to a camera lens. The focused light allows you to form an image on the retina. Retina is positioned at the back of the eye and is a layer of tissue that senses light and colour. The retina converts light and colour into electrical signals. Optic Nerve transmits electrical signals from the retina to the brain. This lets us interpret and understand the information transmitted from the eye. The cornea is a transparent layer of tissue that covers the front of the eye and helps protect it from damage. If there is an abnormality with curvature of the cornea, i.e. it’s too flat, if can cause long-sightedness. The lens focusses incoming light onto the retina by refracting or bending the light evenly to give a clear view of the object. If the lens is too thin or is not round enough, this can disrupt how the light is refracted, causing the light to be focused behind the retina, instead of on it. However, it is not possible for the light to be focused behind the retina, so the lens changes its thickness to try and correct the refractive error - this is called accommodation. However, long-sightedness cannot be accommodated fully, which means the light is still not focused correctly and objects close up are blurred. Age – While hyperopia can occur at any age, it tends to be more noticeable after 40. Age-related long-sightedness is called presbyopia, and usually develops when the lens stiffens. Genetics – It is thought that some can inherit long-sightedness from parents. However, further research is needed, only in the rare form of hyperopia called nanophthalmos have specific genes been identified. Orbital tumours - tumours in the tissues and structure around the eyeball. Long-sightedness is usually diagnosed in an early eye exam and is easily corrected for most people. However, if the condition isn’t diagnosed in children and is left untreated, it may affect their vision permanently (see complications above). Babies usually have an eye examination at birth, or within 72 hours. Between 6 and 8 weeks old, they will have a second eye examination, usually carried out by a GP as part of a routine screening programme. If you have concerns about your child’s vision, you can have their eyes tested at any time by an optometrist in an optician. Optometrists conduct eye exams and test sight, and if needed, they prescribe glasses or contact lenses. They can also recognise eye conditions and sight defects. If your child’s vision is normal, it’s important to take them for a regular eye check once every year at a high street opticians. These eye tests are free for all children under 16 years old, and those under 19 years in full time education. Adults should have routine eye tests once every two years, unless you have been advised otherwise. Eye tests at an optician usually take up to half an hour, checking your vision as well as your eye health. An optometrist will normally start by asking about your history and symptoms, such as if there any specific problems with your sight, and if so, how long you’ve had the symptoms. This may include questions about your wider health, lifestyle, and medication. The history is usually followed by an eye exam to check for any underlying problems. The optometrist uses an ophthalmoscope to shine light through the pupil, examining the inside and testing the reflexes of the pupil. They will also check eye movements and coordination to ensure both eyes are synchronised. Other factors such as age and medical history can require a few further tests to check for certain eye conditions, most commonly glaucoma –changes in pressure can damage the optic nerve- and diabetic retinopathy - new blood vessels (in the eye) caused by high blood pressure or high blood sugar, that interfere with your eyesight. You will then have a vision test that helps assess your near vision (e.g. reading), intermediate vision (using a computer), and distance vision. There’s also a visual acuity test, which normally involves reading from a Snellen chart – (the famous chart with rows of random letters that get increasingly smaller). If you already wear glasses, you will need to bring them for some of the tests. If you have problems with your sight, more tests will be done to determine the extent of the condition, and the type of lenses needed to correct it. Prescription glasses or contact lenses are the main treatment for correcting long-sightedness. There are also a number of surgical techniques used to treat hyperopia, including laser eye surgery – however this treatment may not be suitable for everyone, including age-related long-sightedness (presbyopia). 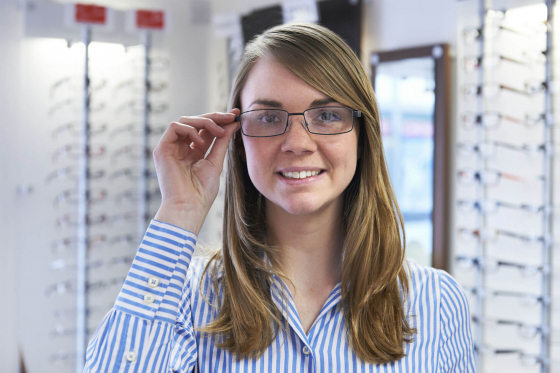 Glasses tailored to your prescription can usually correct long-sightedness. The lenses are usually convex – thinner at the edge than the centre – and the lens’ curvature, thickness, and weight depends on the severity of the condition. The prescription lens allows refracted light to focus onto the retina correctly letting you see close up objects sharply and clearly. Because the lens stiffens with age, your prescription strength may increase as you get older, it is therefore important to continue to have regular eye tests. If you find that you become both long- and short-sighted (which is possible with older age), you may need two different pairs of glasses, or one pair with varifocal or bifocal lenses. Contact lenses work in the same way as glasses, but are preferable for aesthetic reasons or for active people for whom glasses may be a burden. There are different types of contact lenses, and your optometrist can advise on the most suitable for you. However, good lens care and hygiene is essential as contact lenses can increase the chances of getting an eye infection. Eye surgery increases the cornea’s curvature by removing tissue from the edge. Laser eye surgery can be a preferential method as no instruments ever touch the eye. The procedure is done entirely with computer controlled lasers – reducing the risk of human error and infection. There are three types of laser eye surgery to correct long-sightedness, however, it isn’t considered an essential medical treatment and is not available free on the NHS – you would have to visit a specialist eye clinic. Photorefractive Keratectomy (PRK) – A laser is used to remove a small part of the corneal surface (Epithelial), it then removes the tissue (carefully controlled by a computer), changing the cornea’s shape. The cornea’s surface is left to heal. Laser Epithelial Keratomileusis (LASEK) – Alcohol loosens the corneal surface before a small flap is lifted to expose the corneal tissue. 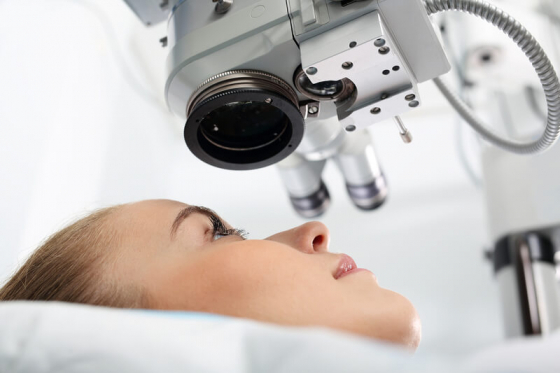 The laser then shapes the cornea to correct the refractive error, when completed, the surface is replaced and natural suction holds it in place. Laser In Situ Keratectomy (LASIK) – A small flap is cut in the corneal surface, which is then folded back for the laser to change the shape of the corneal tissue. The flap is returned to its original position and natural suction holds it in place. In some cases, suitable patients may be able to have a ‘keyhole’ operation, where small incisions are made instead of a flap. This is the most common laser eye surgery technique used in the UK but can only be performed if the cornea is thick enough. Recovery of your eyesight is quick, and it is the least painful method (virtually no pain), however, as it is more complex, if there are complications, they may be more serious. The laser treatment is often an outpatient procedure (no overnight stay) and can take 30-60 minutes to complete. After the treatment, you will most likely have one or more follow up appointments at the clinic to check that the initial surgery was fully successful and to ensure your eyes are healing at the correct rate. All surgery carries risks, and your surgeon will make these clear to you before going ahead. While the complications below are very rare, they are still risks associated with the surgery. Vision may become worse after surgery if too much tissue is cut away. When replaced, the cut flap may grow into the main part of the cornea, possibly causing vision problems that will need to be corrected with another procedure. Reduction in corneal thickness, which leads to reduced vision, or vision loss (ectasia).